We are a local affiliate of Right to Life of Michigan. Together we enjoy a shared membership agreement. When you become a member of Jackson Right to Life, you also become a member of Right to Life of Michigan. Our annual membership then, is able to speak with one voice, and together we make a difference. You will receive timely communications about our local projects and activities, information about the various opportunities for participation and support, state and national prolife legislative developments and the Right to Life of Michigan newspaper. 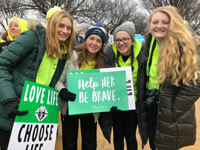 Prolife volunteers are the spokes in the wheel that keep our movement strong, growing and effective. Please consider the following areas of interest where your time and talents can make a difference for innocent human life.